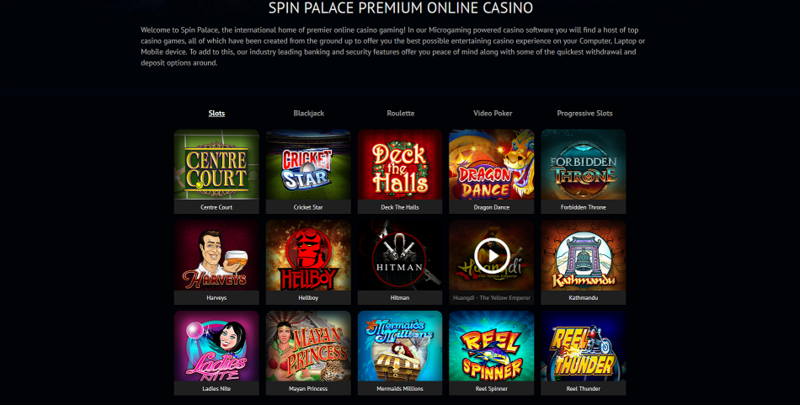 Spin Palace Casino: Instant €400 to Play 400+ Casino Games! Spin Palace started their journey in 2001, so they know how to treat their players right. Let’s have a look at what makes Spin Palace Casino so special, from the games to the bonuses and the mobile casino. When it comes to welcome bonuses, Spin Palace Casino treats you like a king. This casino meets you with open arms with a splendid welcome offer for up to €1,000 in free money. To access the offer, you need to open a risk-free account and…to be quick. This Spin Palace Casino bonus is valid for seven days after you sign up for the first time. Don’t play any casino games if you haven’t read the Terms & Conditions of Spin Palace Casino. There’s nothing revolutionary in there, but it’s always good to know everything about a room before you move to real money play. The deposit match offer is not the only casino bonus offer available at Spin Palace! The casino promotes several time-limited offers, so you need to make sure you check your account on a regular basis if you don’t want to miss them. Also, Spin Palace has a wonderful loyalty club program. Every time you play, you earn points which you can exchange for free casino credits. Spin Palace gives you a free €10 bonus to play real money games for every 1,000 points you collect. When I created my account, and I entered the lobby after my first login, Spin Palace…surprised me. I can see that developers worked hard on the site to create a casino page that is functional and easy to use at the same time. At first, a huge banner catches your eyes. That’s where they display all the hot promotions available - so make sure you spend a second to look at it. Underneath the banner, you find the list of games available on their platform. There are around 400 games available at this casino. 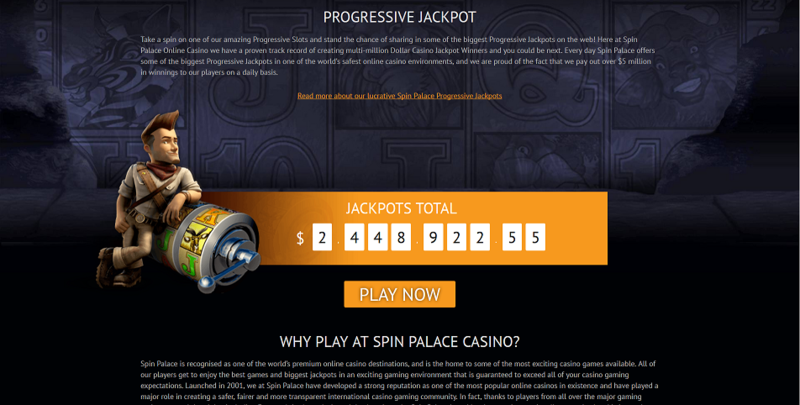 However, this number is continually growing as Spin Palace adds some new games every month. I like that there’s also a “Last Played” section where you find a history of the games you played already. Also, you can create your list of your favorite games so that you don’t need to waste time on tedious searches. It’s the little things like this one that makes a casino room stand out. Finally, we have two exciting sections named “Hot and “Cold. Here is where you can access the most and the least favorite games in one click. Why list the least popular games, you ask? Strange players like me, love to check out the underdogs and play what no one else is playing. Once again, well done Spin Palace. The casino has hundreds of exciting slots by Microgaming. Just open the “Slots” section and use the infinite scroll feature to navigate through all the games on the platform. If you’re not ready to play for real money immediately, you can try out all the games in their demo mode. You can open a risk-free account to play in demo mode on this page. We might have different taste in games, and these might not be your favorite picks but - chances are you will love at least one of these I listed. My second favorite section of any online casino is the one where I can play table games, and the one at Spin Palace is excellent. Of course, if you just scroll down the blackjack section, you’ll see plenty of other exciting versions of this classic card game. Can you play the games at Spin Palace from your mobile? Spin Palace has a beautiful mobile platform. Just access the casino from your phone, and that’s it - you’re ready to play! If, however, you want to download Spin Palace Casino - feel free to do so! The casino has a high-quality app that you can install on your iPhone or Android phone. What’s more, the site is compatible with Windows, Mac, and Linux operating systems. To write this review, I tried to contact the customer support for some questions. I used the 24/7 chat feature and I got connected to a staff member immediately. The room’s representative was very polite and answered all my questions professionally and with care. If you don’t like to use the live chat, can also write them via email to support@thepalacegroup.com. Spin Palace is a classic casino site that many consider being the best casino room in the world. Launched in 2001, this casino has almost perfected the art of offering what’s best for a player. A huge number of games, generous bonuses, and a friendly customer support make Spin Palace one of the best sites for those players seeking the fun of casino gambling in a modern, protected, and regulated environment. There are many deposit options on Spin Palace. You can choose the most convenient one for you.